2014 is a big year! Lots of goals and most of these relatively short term goals are to prepare me for 2015 and the charity run we have planned that will take the DAWS Spinal Muscular Atrophy Running Team (S.M.A.R.T.) 500 miles from The Walt Disney Family Museum to the gates of Disneyland after which we will run the Dumbo Double Dare to top off the mission to raise awareness and funding for research on Spinal Muscular Atrophy, a genetic disease that is the #1 killer of children under the age of two years. So how does one prepare to run 19 back-to-back marathons to equal 500 miles then think it’ll be a walk to run another 19.3 miles around Disneyland? 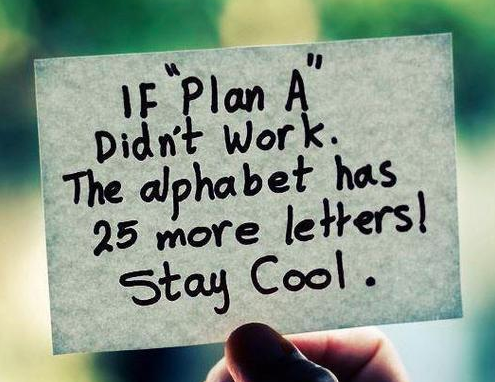 The answer: Lots of planning! I need to bring my physical self to a whole new level and I plan to do that by training for three BIG events in 2014 with several smaller events sprinkled in for continued motivation and fun. You can checkout my full race schedule here! 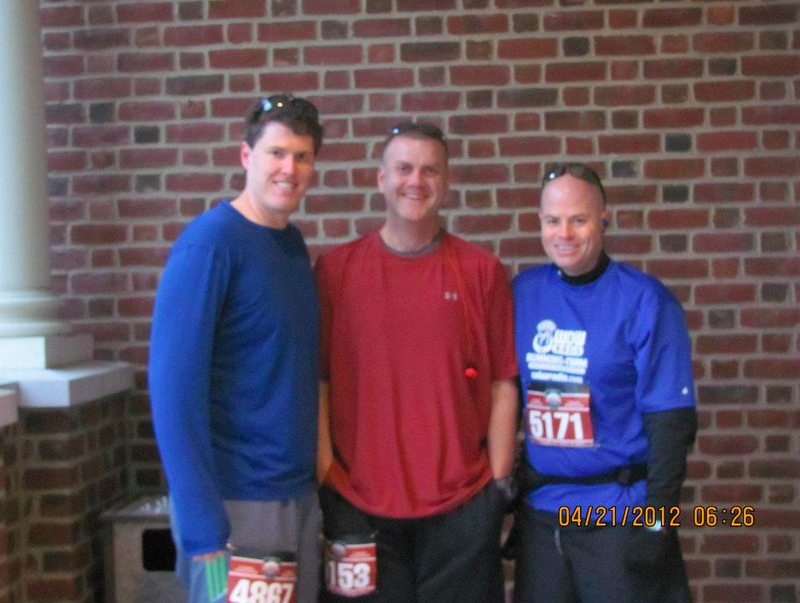 Let me know if you’ll be at any of the races and we can meet-up for a pre-race photo while we still look good! This run spans 45 miles. I will run it solo (I’ll have a support crew) on June 14, 2014. The event is timed and the cutoff is 9-hours. This will be the most difficult event of the year due to the cutoff. This ultra marathon event will be a huge push for me. I am planning on dropping 25 pounds to reach my best performance weight prior to this event, but it is the staging ground for all other events in 2014. This ride will take me 164 miles across the state of Indiana in a single day. On July 12, 2014 I’ll ride this event with a group of friends so this should be a fun event, but I will not let the future fun detract from the fact that I’ll need to spend quite a bit of time in the bike saddle in order to prepare myself to go the distance. Thank goodness this one has a lunch break around the halfway mark! I am in the process of becoming a triathlete and with this event on September 7, 2014, I will earn my place as a more all around athlete. This event includes a 1.2 mile open water swim, 56 mile bike ride and a half marathon. This one is a little scary as I haven’t swam any distance at all in the last 20 years and before that it was just laps during swimming in middle school…good times! Training for three events is taking a lot of patience and planning. Currently I am doing two-a-day workouts in the morning and at lunch with a long run on Saturdays and a long bike ride on Sundays. The cross training is helping my recovery from any one workout. I usually swim in the mornings three days a week, and then also lift and bike in the mornings two days a week. Across lunches I’ll either do the elliptical for 60 minutes or run either a tempo run or do intervals. If I need a rest day then I take one and I have planned in pull back weeks where I drop my training volume significantly in order to let my body rest that week. I was already trained to run a full marathon at Disney so it’s good to be starting from a solid fitness base. Dialing in my nutrition will be an important part of the training as will my recovery efforts. Nutrition will be 70% of the training as I must reach a healthy performance weight in order to maximize my training and push the envelope on training volume when I need to. Of course, on September 8, 2014 what’s a guy to do considering all three of the big events will be completed? Easy, I “start” training for the Dopey Challenge at Walt Disney World coming up in January 2015. I have a half marathon planned in October and in November I have a full marathon and a 30-mile ultra marathon on back-to-back weekends. I’ll be 8 weeks out from the Dopey Challenge at this point and poised to run a great series of races across four days! I’m hoping to take a lot of pictures and have a lot of fun this year as I reach my short term fitness goals to prepare me for 2015 and the DAWS running team’s 500 Mile Challenge. So expect a LOT of race recaps this year! This one is for Joe, Mitch, Kathy, Robyn, Chelsea, Kate and few more yet to come. When I first looked at the training plan for the ultra marathon I’m going to run in November I knew it was different compared to training for a 5K, half or full marathon. Some would surmise that the plan would be exactly like a marathon training program only the long runs would be longer. The two biggest differences in this training program are the lack of speed work and the focus on specificity in trail running. While the book does say you can put in interval training or other types of speed work it also says don’t worry if you don’t or would rather not. Total volume of miles is the key along with “time on feet”. I like the specificity training. I’ve done some trail running the last couple weeks and have not only enjoyed the scenery, but also have loved the softness of the ground compared to running on pavement or concrete. Seeing how this program is a little different it is only fitting that my first workout for the ultra training program was a weights workout at noon on Monday. I hit full body alternating between upper and lower and taking it easy on the legs since I have three runs on consecutive days and two days with double runs. Tuesday morning I ran a 10K at the gym and I ran just under 4 miles at lunch. The 10K felt great and I kept the speed down to around a 10min/mile pace. I could definitely feel the walking lunges from Monday’s workout. On occasion I forget how much walking lunges help me run. If you are a runner and want to run faster or with better form then just add walking lunges to your workout once or twice a week. The 4 miler was an easy jaunt down the Monon Trail and back. On the way back I ran in the soft gravel on the side of the trail to mimic a trail as much as possible. Wednesday morning (today) I did an easy 4 miler at the gym with a little incline. The schedule called for 3 miles, but I wanted to make up a little mileage where ever I can since I’ll not be going long on Saturday morning as I normally would. Even though it’s my first week of ultra training I am hitting the local festivities for Carb Day this coming Friday at the Indianapolis Motor Speedway which means I won’t feel like running 10+ miles on Saturday morning. This is also why I’m putting in a few extra miles on Tuesday and Thursday at lunch! I’ve said it countless times before. Plan those celebrations into your training so you don’t feel like your training is making you miss out on life. There are certain things in life you will never be able to out run. Some would cite death and taxes as the inevitable, but to add to this short list I would also say you cannot outrun time, police radio and the heat during any length marathon as many discovered on Cinco de Mayo this past Saturday for the Indianapolis 500 Festival Mini Marathon. According to the local paper the men’s top finisher this year had the slowest time in two decades due to the heat at 01:05:08. The women’s top finisher came in about 10 minutes later at 01:15:22 and then was removed from the finish area by stretcher due to heat exhaustion. My own experience also saw the effects of the heat. I was feeling fine 5-6 miles into the run and then realized my pace had slowed drastically around mile seven on the Indy 500 Motor Speedway 2.5 Mile Track. Overall, I am happy with my time of 02:19:52 which was still good enough to get seeded for next year’s race. The heat slowed me down by 14 minutes as compared to my 2011 PR. This year I started in Corral D. To give you some perspective the Indianapolis Mini Marathon is the largest half marathon in the United States selling out the last 11 years. The 35,000 runners come from all 50 states and quite a few other countries to run the flat and fast Indy course. I started the run at a good pace hoping the heat wouldn’t bother me as much as I actually like running in the heat, but while the heat wasn’t so bad for me ranging from the upper 60s to upper 70s the humidity was over 90% with a dew point of 68 making it difficult to dissipate heat from your body. Otherwise the day was very nice and I even felt comfortable on the run once I slowed my pace to a speed that was more manageable for the day’s weather. After the race I continued drinking Gatorade and water, ate a banana, a cookie, and two fruit snacks offered at the finish. I knew I needed to keep nutrients and fluids flowing to my system to combat the effects of the heat. Once I got back to my car I had my traditional EAS Chocolate Myoplex Shake. My family had a BBQ that afternoon and I indulged a little for a race well run and to kick off the summer right! I kept drinking fluids the entire afternoon to work on rehydrating my body. Many people stop because they already have had a bottle of water after the race. Please don’t make this mistake. The best indicator that you are rehydrated is when you finally urinate a light yellow to clear color after the race. For me that didn’t happen until over 11 hours after the end of the race. This tells me that I was very dehydrated after the race. It took over 11 hours to even feel the urge to go! Once I got home I wore my Zoot Compression Socks to help the blood flow back to my heart and to assist in vacating any lactic acid build up in my lower legs. Planned recovery efforts can make a big difference between enjoying the days after a race and suffering for several days. I’ll take Sunday off and then do a light workout on Monday most likely hitting a short 2-3 mile run and a light full body weights workout. My next run is the Hendrick’s County Park 2 Park Relay where I will join five other teammates to run 60-miles to raise money for the local Hendrick’s County Park system. 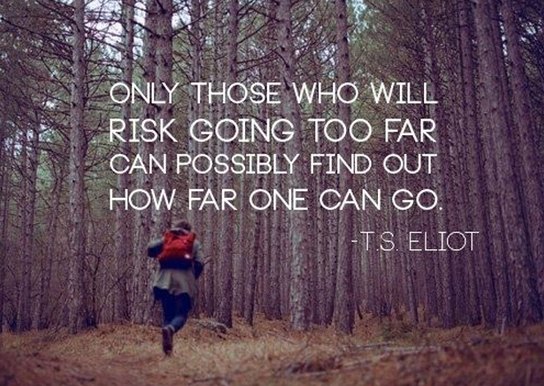 This coming week starts a ramp up to my ultra marathon training which will officially begin in two weeks. I’m excited to start training for this new challenge! Happy Belated Earth Day! Odd way to start a running blog post I know, but the Saturday of the Carmel Marathon was Earth Day after all. I realized this when I saw my finishers medal on Saturday, but I digress. To say this was a standard marathon run would be far from reality. First, I decided to do this marathon at about 7:00pm the Thursday before the race. Second, not only was this race impromptu I hadn’t really been training for it. I had done several longer runs with a good friend of mine who had the sense to actually train for this 26.2 mile adventure, but otherwise I had been focused on trying for a PR on May 5th at the Indianapolis Mini Marathon. As fate would have it I tweaked my knee a couple weeks ago doing some core work which made speed a problem for me. It turned out to be more of a bother than a true injury. …don’t worry, I had my knee checked by an NP and my chiropractor independently. Both came to the same conclusion independently that I had just tweaked it a little and that there was no ligament or meniscus damage. They both told me to take it easy for a week by cutting my mileage volume and to return to full activity as I saw fit. As I returned to full activity I realized that speed was an issue, but distance wasn’t so I decided “what the hey!” and registered for the marathon. I had done all the long runs with my friend so I felt the distance was in reach. One caveat is that my PR goal for the Mini Marathon is on hold for now. So back to the marathon recap! 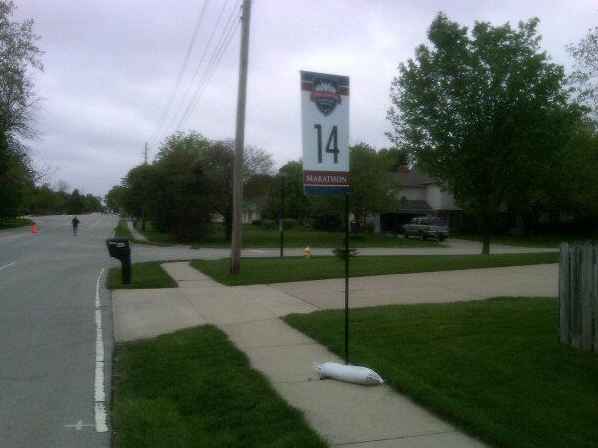 I ran the Carmel half marathon last year for the inaugural event when it was scheduled in June. 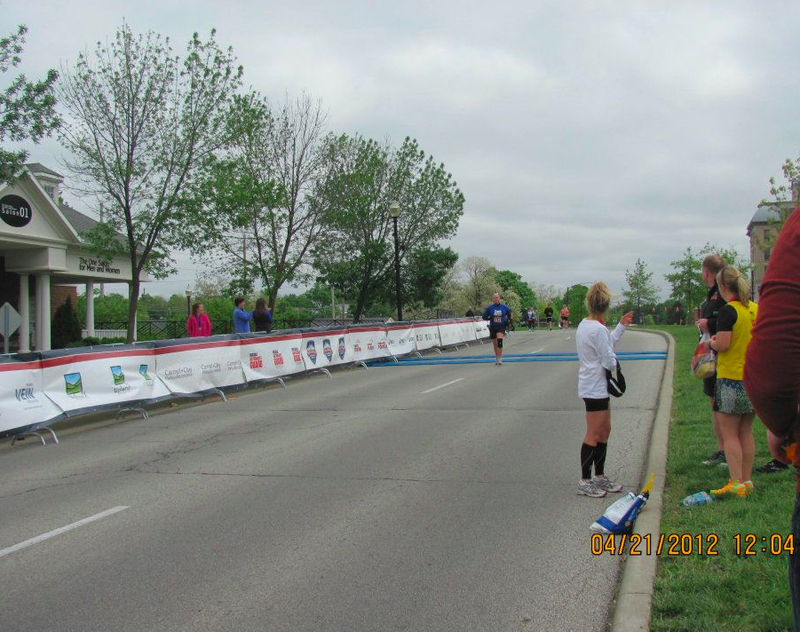 That race was super hot and my performance suffered as I came in 20-30 minutes behind what I expected from my 02:05:00+ performance at the Indy Mini Marathon in May. This year was chillier with temperatures in the low to mid 40s for most of the race and a 14mph wind that chilled you when running into it. The weather was predicted to break and get a little sunnier with temperatures in the low 50s. This never happened so the entire race was in the 40s and overcast. I started out with my friend and quickly had to slow as my left shin was super tight. I told my friend to go it alone and I dropped back. Somewhere around mile 5 a lady approached and remarked that I was not Lou Mongello. Lou is the founder of the WDW Radio Running Team and the online podcast phenomena by the same name (sans running). I was wearing my WDW Radio Running Team shirt for the race. It’s pretty cool when someone so far from Disney recognizes the shirt and the efforts of the team toward the Dream Team Project and the Make-a-Wish Foundation. A little over halfway to the finish! I stayed with this group until mile 15, but then dropped back with another runner. We made a valiant effort to keep the 5-hour pacer in sight, but it wasn’t to be. Still, I knew there was a 5:30:00 pacer somewhere behind us so I didn’t worry. My new running partner and I took on a run/walk regimen for the remainder of the race and kept on motivating each other. Thanks Lisa! It wasn’t long and the miles ahead became less than the miles behind us. Soon after we were running through the Carmel Art & Design district headed for the finish line. On the final stretch I kicked it into gear for a sprint to the finish. I'm the blue dot about in the center. I finished up by doing a few high (or medium rather) fives as I went into the finisher’s chute. All my friends had waited for me to finish. Luckily I didn’t make them wait too long….well, except Dave. He finished in a little over 4 hours! He’s a machine! 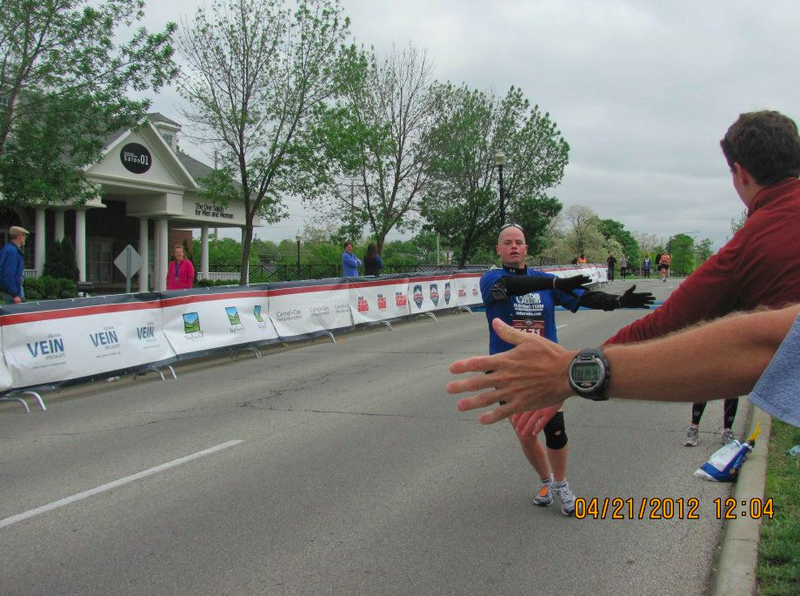 A few low to medium fives as I run into the finisher's chute. All in all it was a good day. I PR’d by 09:41, met a lot of cool people, and added another marathon to the list. There’s only one other marathon road race in the local Indy area that I haven’t run, the Indianapolis Marathon, but I’ll have to wait until next year to run that one as I already am running a trail marathon on that same day this year near West Lafayette, IN. Over the last few weeks I have been reading the book, Relentless Forward Progress, which is a guide for running ultra marathons and includes several training plans for distances from 50K to 100 miles. I opted to use a 50-mile maximum week training plan for my first 50-mile ultra. Of course, as usual I have adapted the program to fit my own needs and to incorporate the various races I have scheduled over the course of the year leading up to my November 3rd ultra event. Similar to the Goofy Challenge Training Plan the training schedule for an ultra relies heavily on back-to-back runs on the weekends only more so than the Goofy as well as increased “time on feet” and volume of mileage. I have one goal for this event…finish in the upright position. So here it is! My ultra marathon training plan complete with two initial ramp-up weeks and one recovery week afterwards. The program starts Monday May 7, 2012. Ultra 24 5 mile Rest 3 Mile Rest 2 mile Ultra! Wine @ the Line = 5 mile run at a winery! Purdue Half = Inaugural Purdue University Half Marathon…can’t miss my alma mater’s inaugural race! So this is a VERY busy training/race schedule for me. I’m looking forward to lots of trail running in Eagle Creek State Park and even travelling down to Spencer, IN a couple times to see what the trails look like for the ultra. No I’m not actually changing my twitter handle to add the word “ultra” and no this is not a post about Dean Karnazes’ book with a similar title…good book though! This is about my next adventure later this year. That’s right, I am registered for my first 50-mile ultra marathon! My ultra of choice is the OPSF 50/50 Ultra Marathon. Good Question! Let’s define an ultra marathon for you. An ultra marathon is any distance foot race/event that is longer than the traditional 26.2 miles of a standard marathon. What about the Goofy Challenge? That was more than 26.2 miles! Why in the name of all that’s holy…?!?!? Why an ultra? Well, that’s a good question! An ultra marathon is like a mountain to some runners. You run it because it’s there. For others it’s just the challenge of the distance. It’s a little bit of both for me plus training for an ultra marathon is much different than training for even a regular 26.2 for both the program and the philosophy. Also, this is a trail run so the environment of the course is much different than a standard road race. So I have a 2-in-1 challenge ahead of me! To prepare for this event I am increasing my training mileage quite a bit. Right now my weekly mileage not including cross-training is close to ~25 miles per week. Once I start the ultra training I’ll boost that number to over 30 miles per week almost immediately…emphasis on “almost” and then increase it from there. It’s advised that you only increase total mileage by 10% from week to week so luckily I have a couple weeks to build up so there isn’t such a huge jump at the start of the program. Another nicety is that the weekly mileage increase primarily comes in the mid-week runs at the start along with the addition of a short Sunday run after a long Saturday run. The first 8-weeks has a small 5-miler on Sunday after the long run on Saturday. I was amazed at how closely the training plan resembles the Goofy Challenge Training just higher mileage. Now that I am a doctoral candidate I am working on defending my proposal this November before starting to collect data come January. Dopey Challenge? I must be Dopey Right Enough!